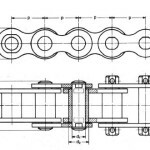 The design of a bush chain is similar to that of a roller chain – but the bush chain has no rollers. When the chain runs over the teeth the bushes slide along the tooth flanks resulting in relatively heavy wear. The noise produced by a moving bush chain is also higher than that of a roller chain. The bush chains acc. to DIN 8164 were developed to achieve a maximum bearing surface for given main dimensions (pins and bushes with greater diameters).